Please call owner Bill at 415-602-0770. Boat is in Scarborough, Maine. Good Condition boat with an ez loader trailer and a breakneck tongue, for better one person loading storage. Barely used, had it out of garage on the water twice this year. We only use in fresh water, Great Fishing boat. Complete with trailer, stored in heated garage when not in use. New trailer LED light kit installed and a new tire and rim. Has a 90 HP Marina Force Outboard just rebuilt with less than 10 hours use. 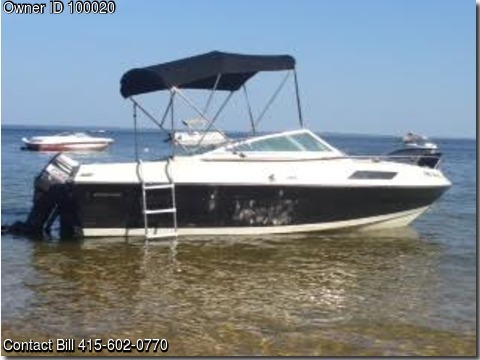 Wide bow, very stable in the water for both fishing and cruising. Has Porta Potty.New gauges, new carpet. Boat Trailer registration good for 2015 trailer has good tires.